The SBE Mentor Program is designed to help broadcast engineers who are new to the field. The program partners a new engineer with a more-seasoned professional. This allows the more-experienced person to share his or her gained knowledge, both empirical and practical, with someone new to the field. 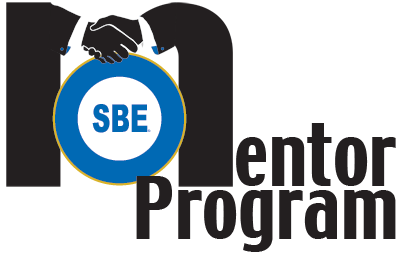 The SBE Mentor Program provides a means for SBE members to share knowledge and experience. For the seasoned mentor, it's a chance to give something back. For the freshman mentee, it's an ideal way to gain inside knowledge and understanding that can sometime take years to accumulate. The partnership will last for one year. The first mentor/mentee partnerships began Oct. 1, 2016. As mentors and mentees apply to participate they will be partnered to work together for one year. Mentors and mentees can establish a schedule that works best for the pair, but the SBE asks that you connect by phone at least once every two weeks. Please complete and submit the appropriate application form. • Is there a cost to be involved with this program? No. This is a member benefit. • Do the mentee and the mentor have to be in the same location? No. The SBE will work hard to match mentors and mentees based on location, but that is not a requirement. • How long does the partnership last? continue to meet after the year is up. • How much time is requried? The Mentor and Mentee can work together to set up a schedule that works best for them. The SBE asks that you meet by phone at least once every two weeks. Activity in this progam qualifies the participants for SBE recertification credits. Mentors can claim 1 recertification credit per 10 contact hours in Category J.
Mentees can claim 1 recertification credit per 10 contact hours in Category I. Contact Certification Director Megan Clappe for more information. If you have questions regarding this program, contact Cathy Orosz at 317-846-9000.